The ceiling light has a three-position switch; ON, Door Activated, and OFF. 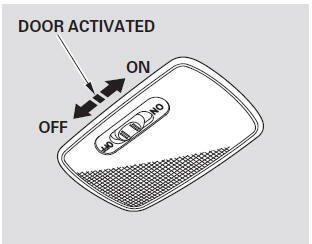 In the Door Activated (center) position, the light comes on when you: • Open any door. After all doors are closed tightly, the light fades out in about 30 seconds. The ceiling light (with the switch in the door activated position) comes on when you remove the key from the ignition switch. If you do not open a door, the light fades out in about 30 seconds. If you leave any door open without the key in the ignition switch, the ceiling light will go off after 3 minutes.